Charlie Mulgrew is a major doubt for Scotland's Euro 2016 qualifiers against Poland and Gibraltar next month, according to Celtic boss Ronny Deila. The defender has missed three matches with a thigh strain. And Deila is not expecting the 29-year-old to be available until after Gordon Strachan's side play their final Group A fixtures on 8 and 11 October. "He's still not on the pitch training (with the) ball so it will be tough to reach the Scotland games," said Deila. "I think that is going to be tough (to make it). I am not 100% in that, I am not a physio - even though I think I am sometimes." 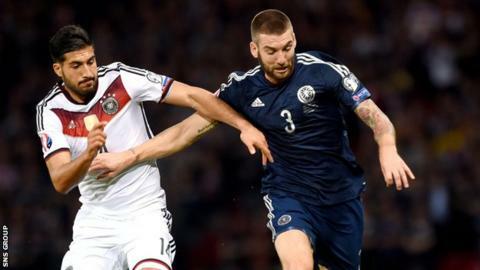 Mulgrew played in this month's defeats to Georgia and Germany, which ended Scotland's hopes of automatic qualification for France 2016. He started in central defence in Tbilisi and played at left-back against the world champions at Hampden for his 20th cap. Scotland sit fourth in Group A and can still finish third for a play-off spot.